Looking For A Place to Sleep This Week? If so, I have some very good news for you. I discovered not just one, but TWO places you can hang your hat! First up, the St. Nicholas Neighborhood Preservation Corporation will be hosting a candle light vigil and sleep out at 202 Franklin Street tomorrow, January 30th starting at 6:30 p.m.
For those of you who are not in the know 202 Franklin Street caught fire nearly four years ago. 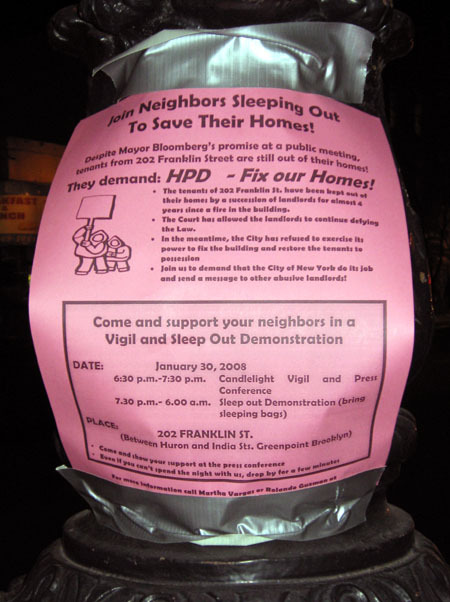 Despite numerous demonstrations, making light of their plight at last year’s town hall meeting and the property being sold several times the necessary repairs needed to enable these rent-stabilized tenants (many of whom have lived here much longer than myself or most of the people reading this for that matter) to move back home have yet to get made. Inasmuch as I hate to get “preachy”, I want each and every person reading this to consider the following: how would you feel if you were driven out of your apartment by a fire and had to wait this long for the landlord (or in this case, landlords) to do the right thing and make repairs? Not everyone in Greenpoint can afford to simply pick up and move. (Those of us who can should consider themselves very, very lucky.) What’s more, these people shouldn’t have to. As tenants they have rights under the law which should be enforced. If you agree with the previous statement (or simply want to learn more about 202 Franklin Street), please swing by tomorrow’s demonstration and let your voice be heard. We are a very diverse lot this is what makes our community so cool. And in the spirit of point #2 I bring you today’s second place to get a good night’s sleep. It invites diversity, albeit of a slightly different caliber. Great location in Greenpoint! Minutes away from trendy Williamsburg or Manhattanâ€™s Lower East Side. You can find laundromats, eclectic restaurants, video stores, fun bars, and just about anything you want within a few blocks. House: A beautiful and large (especially for New York) pre-war house. On the first level is the living room, a half bathroom, and a large bright kitchen which is fully equipped. On the second floor are 4 bedrooms and a bathroom with a skylight and beautiful clawfoot tub. There are hardwood floors throughout the house and it gets plenty of light. We also have a backyard! The place is shabby-chic, clean, and a peaceful sanctuary not far from the excitement of NYC. Room: The last remaining available room (emphasis mine— Ed. Note) is New York-sized (translation = small), but is very well organized and has everything you’ll need for your stay. It is a cozy room with a Murphy bed that folds up into the wall when not in use, to maximize the space. It has a large window and is nice & quiet. There is a built-in closet system. It also goes on to say your new landlords (inn keepers?) are “laid-back, friendly and responsible people who have full-time jobs” and “celebrate diversity and would love to open our home to our friends in the international community”. Their ad copy does not sound so much like an apartment share than a hotel or SRO. A comparison to a hostel was used not once, but twice. Why the emphasis on “short term”? If one were to rent (or sublet) a room wouldn’t a long term tenant be more attractive? Not only would you have the prospect of sustained monthly income, but you will probably attract a more responsible type of client. Just a thought. Of course I am assuming this deal is on the “up and up”— and it probably isn’t. Do the people who are soliciting this room for rent own or rent the house in question? If it is the former, are they reporting the income? If it is the latter, is their landlord aware of this arrangement? I doubt it. 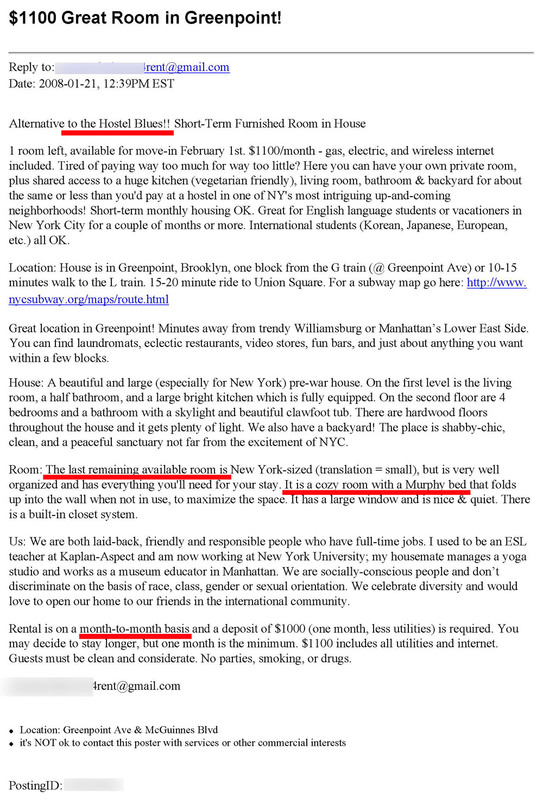 $1,100/month “rent” is a draconian amount of money to demand for a small room with a murphy bed. Even in Greenpoint. Do I think someone should be able to rent a bedroom in his or her apartment, e.g. ; an apartment share? YES, ABSOLUTELY. Should someone be able to lease rooms in his/her house in a manner more in keeping with a hotel (and in all probability making a tidy profit in so doing)? Absolutely NOT. There are hotels and then there are houses. Hotels are built and operated to manage transient populations, a house is not. While I am fully aware this neighborhood is becoming less and less affordable nowadays, this advertisement (and what it proposes) is not only ridiculous but it also lowers the quality of life for everyone involved, tenants (be they foreign nationals or otherwise), landlords and neighbors alike. My advice: if you’re looking for a cheap place to stay go to the Greenpoint Hotel. Granted it is a dump, but at $450 a month it is a LOT more affordable. *Lest this ad has been removed, click here for a screencap. One Comment on Looking For A Place to Sleep This Week? um, “minutes” away from the LES? yes, THIRTY minutes away from the LES. it’d be 10 even if you drove. I wouldn’t even send people to the Greenpoint Hotel. If someone needs a short-term place in greenpoint, why not the Y? At $40-something dollars per night, including breakfast and access to the pool and gym, it’s a much better alternative. 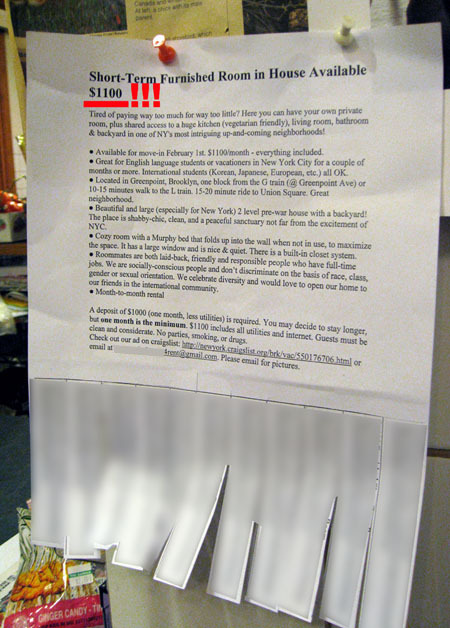 $1100 for a one-bedroom share is so ridiculous it’s not even funny. there are probably still some apartments up at your end of town that rent for that amount of money. but, they will learn when no one replies. i think i have an idea which building this might be in. it would be interesting if their landlord knew about this.